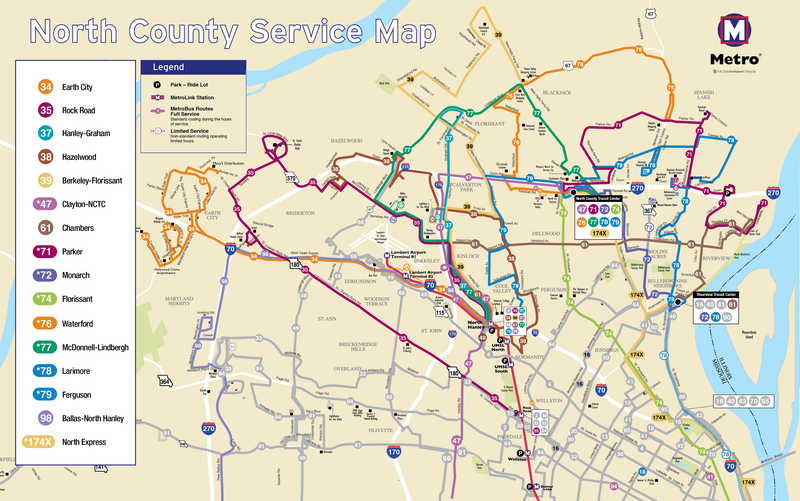 In a few weeks, transit service in North St. Louis County will undergo significant changes, providing passengers better connections to key destinations, faster transfers, more direct service and more frequent service during weekend and evening hours. The change, effective on Monday, March 14, is made possible by the opening of the North County Transit Center in Ferguson, also scheduled to open March 14. This new transit center, located at 3140 Pershall Road between West Florissant Avenue and New Halls Ferry Road, will offer passengers an even better transit experience with new amenities and features, including: public restrooms, a climate-controlled waiting area, 24/7 security, digital arrival time display boards, a Park-Ride lot and a cafe (slated to open sometime this summer). Last year, Metro hosted four open-house style meetings at the Riverview Transit Center, North Hanley Transit Center, St. Louis Community College – Florissant Valley and Trinity Catholic High School, to engage transit users and the public about Metro service in North St. Louis County and find out how the new plan fits their transportation needs. The feedback received from those meetings, as well as feedback received online, helped Metro determine what adjustments or modifications were needed to be incorporate into the service plan. North St. Louis County is one of Metro’s fastest growing public transit markets, accounting for 19 percent of total MetroBus and MetroLink ridership. View public information schedule and prepare for the March 14 service change. In addition to changes coming to North St. Louis County, March 14 will also see significant changes to several MetroBus routes serving downtown St. Louis, West St. Louis County, Illinois and other areas in the region. Wow…this is just bad. Where to begin with how terrible this is. I guess we can start by the fact that the #77 bus drives by the radioactive site the Army Corps of Engineers is remediating on the north side of the airport. The #35 now gets to touch both that and the Westlake Landfill. Frost Avenue is a two lane road with a divider down the middle in parts of it. Why does it look like the #38 is going down Pershall to the old Ford Factory. There are parts of the #77 and #38 in Hazelwood that look like they could be swapped out, such as the #77 going to Village Square, then going on to Dunn then Howdershell then onto I-270 to North Hanley Station. If the #35 is going to drive around the Campus Parkway area, why not drive a lap around Campus Parkway, Anglum, and Phantom, and back onto McDonnell. I see we still don’t have access through the tunnel on Lindbergh. And finally, the most important piece of constructive criticism: LEAVE THE #47 ALONE! It would have been nice if the #37 made it to Flower Valley instead of this strange loop around Lindbergh, Washington, and St. Ferdinand. You’re probably better off leaving the #47 as it currently is because this is not how you get folks to use the new transit center or make more money from transfers. It’s how you make a simple commute between Clayton and Florissant into yet more transfer scamming. We’ve got a good route going. And the #77 seems like a good reason to stop at the transfer center. I can’t say the same for the #174X. I still sorely miss the days when the #74 went from Flower Valley to Downtown during more than just the weekday Rush Hours. So don’t touch the #47! Thank you for your comments and feedback. Metro has undergone extensive research on Metro ridership and travel patterns to construct the new routing in North County St. Louis County. Metro has also conducted many public meeting over the last year and received numerous amounts of feedback from passengers like you. We know these changes won’t work for everyone, so we will continuously evaluate the changes and adjust schedules and routing as necessary. Please continue to let us know your feedback once the changes take effect and are in service for a month or so. You may contact us directly at 314-982-1406 or email us at customerservice@metrostlouis.org.